As the UK’s summer festival season drew to a close, there was still time for one of Ibiza’s partying strongholds to bring three days of premier dance music to the UK. 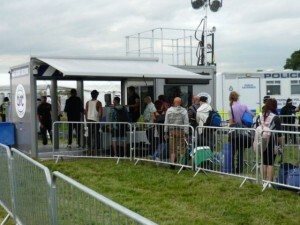 AP Security was on hand with a unique mobile security checkpoint to help ensure that the Zoo Project Festival’s party animals enjoyed themselves safely. Held on the last weekend of August at the perhaps unlikely venue of Donington Park - more famous for heavy metal festivals than music from the infamous Mediterranean island - the festival saw sets by nearly 90 artists across four stages. AP Security provided crowd management services to the entire site, with a team headed by Chris Hollands helping to ensure that the event ran smoothly. A new aid for AP came in the form of the unique Access Risk Control (ARC) mobile checkpoint. Deployed for the first time at a major event, it made audience and baggage screening as quick and efficient as possible throughout the weekend. "The ARC system provided us with full, airport standard screening facilities, which removed the possibility of weapons, banned items and other illegal objects from entering the festival site," says Chris. "As well as the ease of use, it was very useful for us that the units were quickly installed and fully operational within 45 minutes." AP staff were also able to monitor the campsite areas using a standalone ARC CCTV tower, fitted with day and night vision HD cameras with data capture. Images were fed back to the control units via secured WiFi to the control unit in real time. Of course AP’s renowned personal touch was also very much to the fore. Staff manning the checkpoints ensured that anything untoward was quickly and politely confiscated, defusing any potential confrontation with the company’s usual friendly approach. 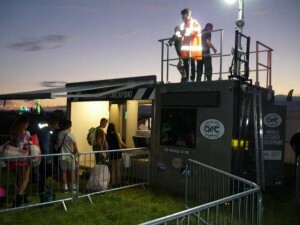 Staff were also stationed throughout the site, covering pit, backstage and all audience areas, as well as complementing the CCTV system in the camp site. 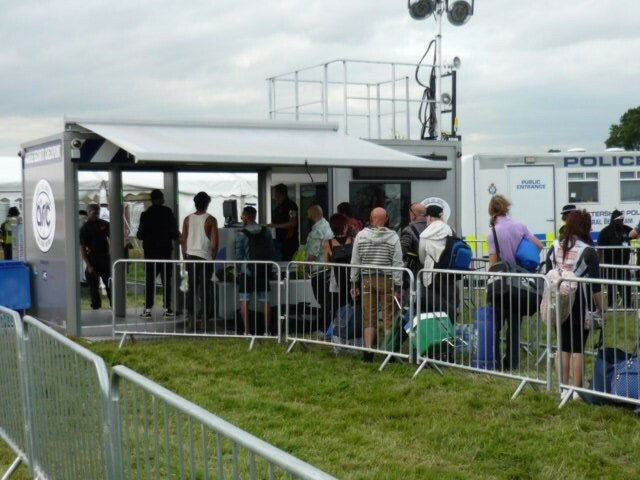 Leicestershire Police were in attendance throughout the weekend and were impressed at the combination of the ARC technology and AP’s personal approach as a ‘soft’ deterrent.